Interactive Dreams: Lemmings on CD-i: "Great puzzles, but other platforms' versions are better"
Lemmings on CD-i: "Great puzzles, but other platforms' versions are better"
It's not a game-killing botch like Axis & Allies, which squandered great source material on a clumsy game, but the CD-i adaptation of "Lemmings" has a few flaws which will frustrate many players. That's a pity, since "Lemmings" is arguably the best computer puzzle game ever devised, and CD-i puzzlers deserve better. The premise is equal parts adorable and sick. A door in the sky opens and the lemmings -- little green-haired guys in blue cloaks -- fall out, hit the ground and start walking. Unless they hit something they can't climb, they'll continue right into the ocean, lava, lemming-smooshing traps, etc. If they do hit something, they turn around and walk the other way, probably into more danger. It's your job to save a certain percentage of the stupid little guys, by assigning skills to members of the horde. The tools at your disposal are indicated at the bottom of the screen, along with the number of times you can use them. For example, if the lemmings are heading towards a pit, you can choose the staircase-building tool and pick the lead lemming; he'll start building a 12-step staircase the other lemmings can safely climb over. You also get three varieties of digging: horizontal, down, and diagonally down. The lemming will continue digging until he gets into the clear, hits steel, or dies. To control the flow of lemmings, you can also use a "blocker", who turns around any lemmings who run into him. And an "explosion" tool tells a lemming to explode, following a five-second countdown. Two skills stay with lemmings as long as they're alive: climbing and parachuting. The latter skill allows lemmings to fall from heights that would otherwise kill them. A lemming with both of these skills is called an "athlete", and is particularly useful to send out in advance of the horde to dig tunnels, build bridges, etc. The playfields can be several screens wide, meaning you need to be careful to know what's happening in several places at once. You scroll by pressing your cursor against the edge of the screen, holding button-two to scroll faster. A tiny map at the bottom right shows the entire level, with a box indicating what's on the main screen. Clicking on this map or dragging the box around provides a way to quickly change your view. 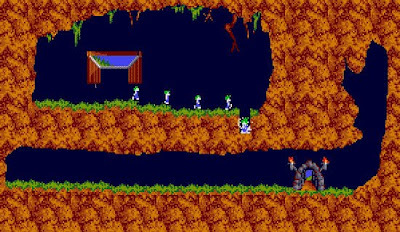 What's always been ingenious about Lemmings is the ways in which the level designs challenge your creativity. Early levels develop your resource management skills, teach you to send out "scout" lemmings to prepare tunnels and bridges for the horde, etc. But later levels challenge you to think about your options in non-intuitive ways -- the digging and staircase tools become a way to turn around a lemming, the bomb becomes an excavation tool, staircases built the wrong direction become ways to catch falling lemmings. 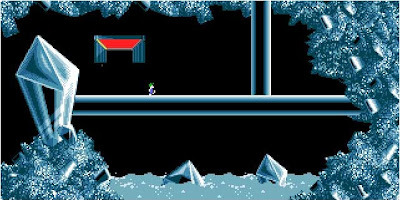 Lemmings has been a classic on every platform for which it's been released -- which seems like every computer and video-game system on the market since the early 90's. That's part of the problem for the CD-i version. It compares unfavorably with other versions, even those developed for less powerful hardware. The first thing I noticed, having played the Macintosh and Atari Lynx versions, is that the lemmings themselves are tiny on the CD-i screen. This makes the action hard to see and difficult to control at times, since it's nearly impossible to pick out a specific lemming unless he's in the clear. If anything, the lemmings should have been larger on the CD-i. Computer players sit right in front of their screen, making small objects perfectly visible, while video-gamers often sit halfway across the room. Not for nothing do CD-i controllers have 12-foot cords. Also, the control problem is exacerbated by what appears to be a slight delay in response to pressing the button. I've noticed about a quarter- to half-second delay. The practical upshot is that if you've selected the digging tool and you're waiting for a lemming to reach a wall you want to tunnel through, you'll hit the button as he reaches the wall... and then be shocked as he turns around and then starts digging the wrong way! 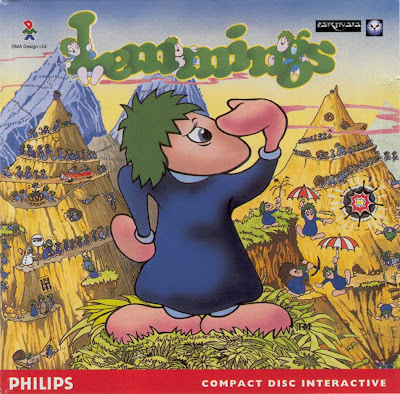 The CD-i version retains the charming music of other versions of Lemmings, and it's got a much more sophisticated timbre and higher sound-quality on the CD-i. In fact, it sounds like the music is being played back from a studio recording of some sort, rather than clinked out in bits and boops by a sound chip. On the other hand, since that limits the ability to switch back and forth between verse, bridge, and chorus, the shorter musical clips get repetitive when played through a dozen times on one level. With 120 levels, this isn't a game you'll finish quickly. At the end of each level, you're given a 10-letter code that can be entered to continue the game later at the highest level you've reached. These codes are the same as for the PC and other home versions. I really don't like these systems, despite their popularity in games with dozens of levels. First off, the type-style used in every version of Lemmings isn't easy to read -- you may botch a password by confusing the nearly-identical D, O, and Q characters. And 10 letters for 120 levels is overkill -- there are 141,167,095,653,380 possible combinations. "Chip's Challenge" on the Lynx and PC only needed four letters for 148 levels. Heck, I've seen adventure games that save your location, inventory, and game status with 10 characters, not just a level number. But beyond that, the CD-i could have used the player's storage to save games, completely eliminating the annoying task of writing down passwords for every level. The space consumption would be trivial, assuming one byte for the level number, 10 bytes for the player's name. I think the only advantage of the password system is that it allows players to get codes from friends, magazines, or the internet to cheat and skip levels they haven't been able to beat -- hardly an advantage. 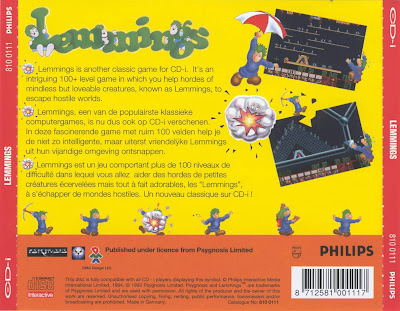 So, should you get "Lemmings" for your CD-i? That depends. If you've played through the 120 levels on another system, the answer is no -- there's nothing more to see here other than a charming intoductory animation. If you've played through part of the game on another system, you're probably better off avoiding the frustrations of this disc and going back to your computer, video-game, or portable. But if you haven't played it, and like many other CD-i owners you're an inveterate puzzler, and you've already finished Merlin's Apprentice... then I think CD-i Lemmings runs neck-and-neck with Dimo's Quest as your action/puzzle game of choice. Dimo has more accurate controls, and better graphics and music... but like Lemmings it has tiny characters, and Dimo's level designs are nowhere near as clever. Besides, what other game has on-screen characters who yell "oh no", grab their heads, and burst into lots of colorful little bits? Flaws aside, Lemmings remains a unique combination of wits, cutes, and sick humor. I played this last night and found it to be worse than I remember it. After coming from most of the other versions available, the slowdown is almost unbearable. It's far from unplayable, it's just.. something that you don't expect in Lemmings. Also, I think part of the reason for the "small" Lemmings is that the screen size in general is shrunk compared to the original PC game and ports--it doesn't take up the full screen space. I find it hard to recommend this one to anyone that owns any other platform from this era, but like the reviewer stated, if you are desperate to play it on your CD-i, it IS still Lemmings, afterall. Even if it's not the best incarnation of it, it's still an enjoyable game.